In 1956, the Florida Constitution was amended to provide for district courts of appeal to assume a major portion of the appellate jurisdiction of the state court system. Initially three districts for those courts were established. 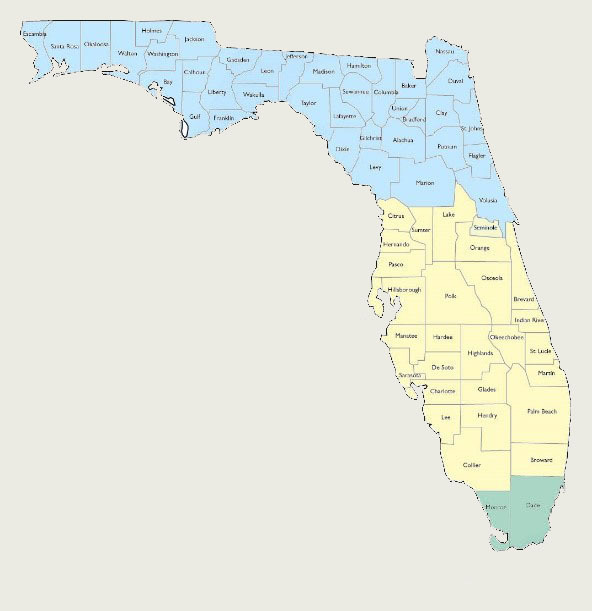 The original territorial jurisdiction of the second district, with its headquarters in Lakeland, encompassed twenty-eight counties, ranging from Lake County in the north, to Collier County and Broward County in the south. In 1965, a fourth district was established, reducing the second district's territory, which was further reduced by the establishment of a fifth district in 1979. There are now fourteen counties in the second district, which includes a population of over 5.5 million people. 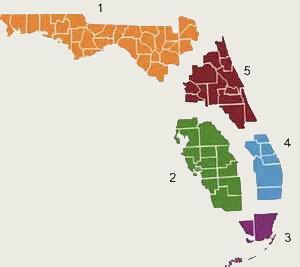 The second district covers Pasco and Pinellas (6th judicial circuit); Hardee, Highlands, and Polk (10th judicial circuit); DeSoto, Manatee, and Sarasota (12th judicial circuit); Hillsborough (13th judicial circuit); and Charlotte, Glades, Collier, Hendry, and Lee (20th judicial circuit). When the Second District Court of Appeal first convened, its headquarters were in the old Florida Citrus Commission building at the corner of Massachusetts Avenue and Main Street in Lakeland. In 1961, the court moved in to a newly constructed courthouse in Lakeland, later named the Lawton M. Chiles, Jr., Courthouse. In 1980 a branch headquarters was authorized and established in Tampa. Since the authorization of the Tampa branch in 1980, the district’s operations have significantly shifted from Lakeland to Tampa. Most of the court's judges now have their chambers in leased space at Stetson University College of Law’s Tampa Law Center. The clerk’s office is the only division of the court that is primarily located in Lakeland, which is required per Florida Statute. The marshal’s staff splits time between both locations. In 2016, because of health issues presented by the 55-year old courthouse, the remaining Lakeland employees moved into leased space in Lakeland. Because the space in Lakeland can no longer support oral arguments, the court holds oral arguments in Stetson’s teaching courtroom in the Tampa Law Center. Periodically, the court also hears oral arguments in county courthouses in various counties within the district. Originally there were three judges in the second district. Those three constituted the panel of judges that heard and decided the cases before the court. In 1958, the first full year of the court's operation, those cases numbered 210. As the caseload of the court increased over the years, the number of judges on the court also increased. There are now 16 judges on the court; the number of cases filed annually between 2000 and 2015 fluctuated between approximately 5,500 and 6,300.